Last April saw Ryan Olson get out to a strong start on the mound for the Daytona Tortugas. The then 23-year-old right handed pitcher had barely pitched in 2017 due to injury. He then came out in April and posted a 2.17 ERA for the Tortugas in five starts with 7 walks and 30 strikeouts over 29.0 innings. Things took a step backwards in May and the next thing you know, Olson was on the disabled list the rest of the season (he made two rehab appearances for Greeneville mid-summer before being shut down) with another back injury. 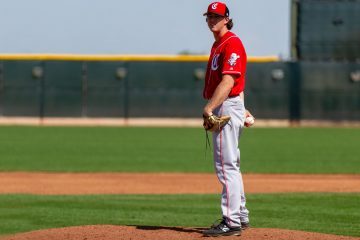 In 2016 the Reds drafted Ryan Olson in the 13th round, but he didn’t pitch that season due to injury. In 2017 with Dayton he made just four starts before being shut down. During the 2018 season he made 10 starts with Daytona before being shut down. Health has been a big problem for the righty from Cal Poly. 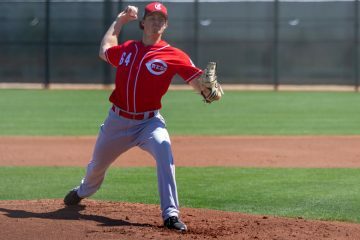 This season, after several years of starting, the Cincinnati Reds have moved Ryan Olson to the bullpen. He’s back in Daytona for now, and he’s made two appearances. They’ve both been multi-inning games and he’s allowed one run in 3.2 innings. He’s also struck out 6 batters and walked just 1. Last night against Palm Beach he was sitting 95-96 MPH and touched 97 in his outing. That helped lead to 3 strikeouts over his 2.0 innings pitched. Staying on the mound will be a key for Ryan Olson. It always has been. But when he’s out there he’s always shown the kind of stuff that will get you noticed. The move to the bullpen is still a new one, but the early results are promising. And hopefully it’ll also help keep him on the mound and allow him to get out there and pitch beyond May for the first time since he was drafted. To get back just to their preseason odds, you would need to assume the Reds have a roster that, given a million games, would go 84-78 on average. That’s about a five-win improvement over what the projections say right now, meaning they would have to sign Craig Kimbrel and Dallas Keuchel just to claw back what they’ve lost since the start of the season. Being the best team in the NL Central (ZiPS currently has the Brewers at .526), would still not get the Reds quite to one-in-five odds. 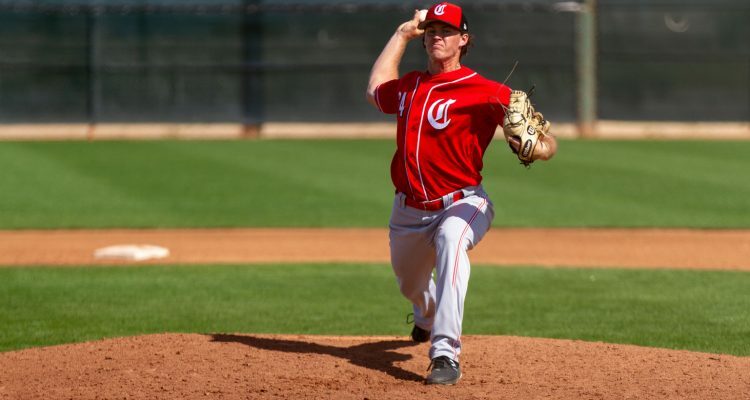 Over at Redleg Nation, Wes Jenkins looks at the decisions made by David Bell thus far in the season and concludes that he’s actually done a pretty good job, but that things simply haven’t worked out. For all the consternation I’ve seen on Twitter regarding David Bell, he hasn’t really done anything wrong yet. One questionable pinch hitter and a few early hooks for relievers, but nothing glaringly dumb. Most of the complaints seem to be hindsight-fueled quibbles, more mad that the decision didn’t work than that it was made. There have been a few things beyond that where I’ve questioned what’s happening, but by-and-large, the complete lack of offense is making the judgment of Bell this season harsher than it otherwise would be. Cincinnati style chili is an acquired taste but locals crave it when we leave town. Skyline Chili is my first stop when I’m back in town. 3 way and one Cheese Coney both with Habanero Cheese. The Reds, I still follow them but don’t crave GABP upon returning home for a visit. Dan Szymborski knows nothing about chili. And that’s all I’ve got to say about that. I consider chili and Skyline two completely different entities…and I love them both. IMHO I get the feeling you’ve got more fat, and less chew, than you can manage. I think you should probably be on a feeding tube of Dr. Seuss and Sesame Street until you can digest more complicated thoughts all on your own.